The 13th annual Atlantic Coast Conference (ACC) Meeting of the Minds conference was held in April at Boston College. This conference celebrates the importance of undergraduate research and provides an opportunity for sharing of ideas and collaboration. Students from each of the 15 ACC Universities apply to give Oral, Poster, Exhibit, and Performance presentations. This year, two students closely affiliated with the Eck Institute for Global Health (EIGH) were selected by the Center for Undergraduate Scholarly Engagement (CUSE) to present their research. Alexis Green ‘19 presented her research entitled: Data on Knowledge, Attitudes and Practices Surrounding Malaria Intervention in Villages of Thailand that was conducted in the summer of 2017. Her research was supported by the Hesburgh-Yusko Scholars Program and hosted by Dr. Theeraphap Chareonviriyaphap of Kasetsart University in Bangkok. Green is a former participant of the EIGH Global Health Case Competition, in which her team won the Innovation Award. 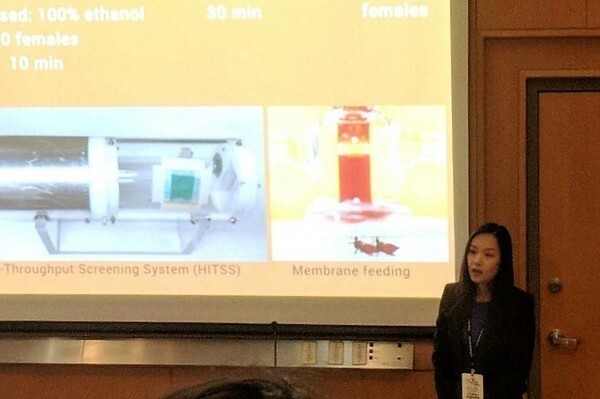 Jugyeong (Esther) Lee ‘18 presented her research entitled: Effect of the Topical Repellent para-Menthane-3, 8-diol on Blood Feeding Behavior and Fecundity of the Dengue Virus Vector Aedes aegypti, which was partially sponsored by an EIGH Undergraduate Research award and was featured in the Scientia ‘Talk Science’ lecture series in 2017. Both Green and Lee are members of prominent EIGH faculty John Grieco and Nicole Achee’s laboratory Grieco is the Associate Director of the EIGH and Achee is an EIGH faculty member. Their lab is currently working on a multidisciplinary program with a focus on the biology, ecology and transmission dynamics of vector-borne illness and vector behavior research related to the epidemiology and control of arthropod-borne diseases. They conduct extensive field research around the world, including Belize, Indonesia, Mexico, Nepal, Peru, South Korea, Suriname, Tanzania, and Thailand. Congratulations to both students for being chosen and thank you for being stellar representatives of the Eck Institute for Global Health! About: The Eck Institute for Global Health is a university-wide enterprise that recognizes health as a fundamental human right and endeavors to promote research, training, and service to advance health standards for all people, especially people in low and middle-income countries, who are disproportionately impacted by preventable diseases. Learn more at globalhealth.nd.edu. Originally published by Kelly Thomson at globalhealth.nd.edu on April 30, 2018.